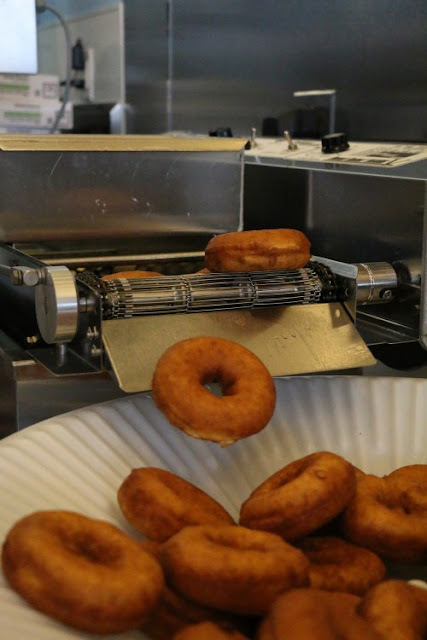 I'm proud to feature Duck Donuts of Green Brook, NJ in my Local Business Spotlight! Duck Donuts is owned and operated by a wonderful New Jersey family. I hope you'll check them out, along with all of the other businesses featured on my Local Business Spotlight Page. Disclosure: I sat and chatted with the owner of Duck Donuts Green Brook, and visited their grand opening celebration to bring you this story! Duck Donuts is a business that began in 2007 in Kitty Hawk, North Carolina, and was named after the little town of Duck in the Outer Banks. The first franchise location of the store opened in Williamsburg, Virginia in 2013. 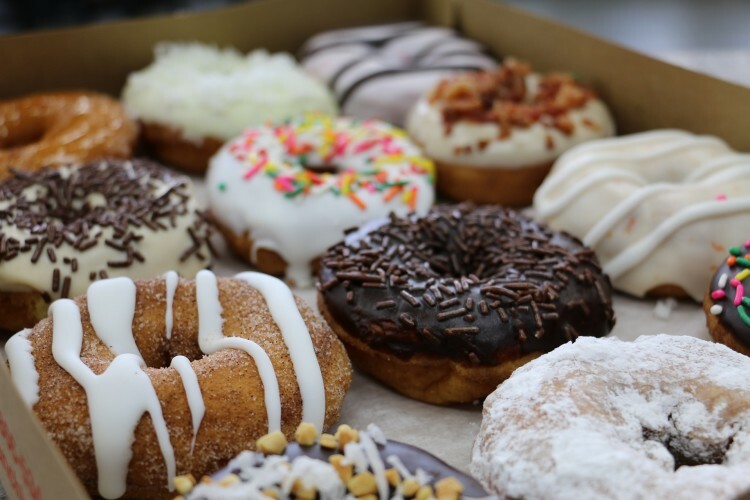 According to their website, Duck Donuts is a family-owned and operated business, and guarantees customers a 'clean, courteous, family friendly, fun and scrumptious experience' (funny, these words kind of describe The Jersey Momma site, too! Hee hee). I can tell you from visiting there myself that this is absolutely true! Everything in the Green Book shop was clean, inviting and bright. There was a counter and little tables to sit at, and it's kid-friendly, too! 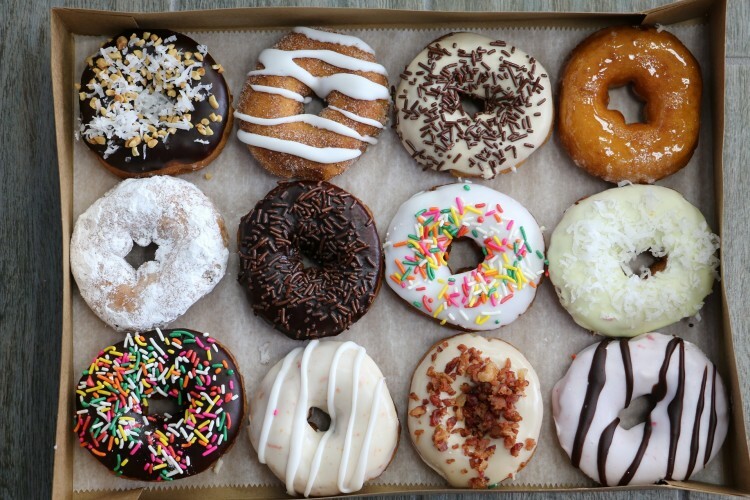 What Sets Duck Donuts Apart from the Rest? When I was a kid, we had an awesome little donut shop near our town, and the donuts were made hot and fresh. The store was always very busy and there was a high turnover rate, so the donuts rarely sat on a shelf for very long before they made a new batch. But that little donut shop closed down decades ago when the owner retired, and I've only been able to find fresh donut shops down the shore. Sure, there are other notorious donut franchise shops out there, but none of them have the mom and pop feel of the small,local shops, not to mention the freshness factor. That's why I'm so excited about Duck Donuts! So the concept of Duck Donuts is that you start with freshly made, hot cake donuts, then choose your own coatings, toppings and drizzle. You can watch your donuts being made right in front of you, which is a big hit with the little ones, as you can imagine (there's even a little step for them to stand on so they can see behind the glass)! If you are worried about knowing what to choose, you can always go on their website in advance and pick out the flavors you want ahead of time (I am such a donut nerd that this is exactly what I did when I visited- I picked out a half dozen and just handed my order to the lady at the counter). They had some special flavors available in store that were not listed on the menu online, so I added one of those to my half dozen order when I arrived! Where is Duck Donuts, Green Brook Located? You can find Duck Donuts at the Green Brook Shopping Center in Green Brook, just over the Bridgewater border on Route 22 East. They are in the same plaza as Bonefish Grill and Gatsby Salon (right past Taco Bell). They are officially open now! You can follow Duck Donuts, Green Brook on Facebook for more information and to stay up to date on their specials and events. They also have an Instagram account if you want to view some of their every day photos. I had the great pleasure of sitting down with the owner of Duck Donuts, Greenbrook (over a fabulous mini brunch at The Farmer and the Chickpea, no less!) to chat about the store, which is now OPEN!! She discovered Duck Donuts herself while on a family vacation to the Outer Banks, and knew she wanted to bring the store to her own community someday. 'I just fell in love with it,' she told me. convenient hours - call ahead or check their site for accurate opening and closing times. When is Duck Donuts, Green Brook Open? 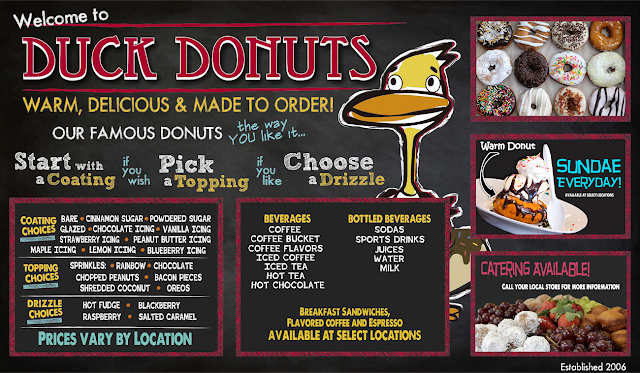 Check the Duck Donuts website for the exact hours of operation, but they usually have early morning hours to suit those breakfast cravings! Stay tuned to The Jersey Momma for more updates about Duck Donuts -Green Brook, or follow me on Facebook, Twitter or Instagram for photos and live videos!